Willpower. Obsessive Inmate does not un-commit from a story until that story is won. to the story during the opponent’s turn. least one character to the story. Obsessive Inmate does stay committed to the story during the opponent’s turn. However, the story he is committed to will not resolve during his opponent’s turn, unless the opponent commits at least one character to the story. 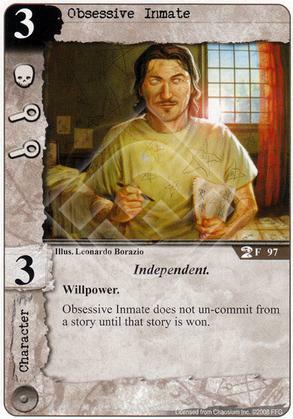 Obsessive Inmate can be uncommitted from a story by means of card effects. However, the struggles still occur, right? So he would score the Investigation struggle even if my opponent doesn't commit, right? No. That is what story resolution is, the resolutions of the story struggles and skill. Therefore, unless an opponent commits a character to the story that Obsessive Inmate is committed to, he will not have the opportunity to get an icon for investigation. Struggles are part of the Resolving a Story Card step of the story phase and since his story explicitly doesn't resolve unless opposed, there will be no Investigation struggle for him to succeed at. Means they can oppose a story you don't want them to win without needing to have a character ready to oppose with. That just seems a bit pointless when my opponent can see I have nothing else and can just kill them off. Winning (I) struggles out of turn was what my group basically decided This one and Obsessive detective were for. 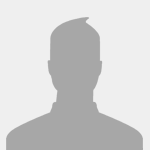 This guy would obviously be better if you could *choose* not to uncommit him, but he is what he is. I had success using him in my Agency/Hastur deck that used 70 steps and Unending Festivities to greatly limit the number ready characters available to go to stories. So not the best 3 drop neutral out there, but certainly not pointless in the right deck. All of the obsessive characters could be interesting with pervasive toxemia. Especially early game.